Growing up on a farm, I’d always thought that I had a more diverse diet than some of my peers, but I’d never really given it much thought until I was in college and taking a Food Anthropology class. It really opened my eyes to the fact that although my family grew some of our own green beans and tomatoes, and always ate lamb and chickens raised by ourselves, the rest of my diet was fairly conventional. The farms surrounding us grew field corn and soy beans, brownies and birthday cakes came from a box, breakfast was a bowl of cereal, and my lunch box always had a clementine and strawberry jam uncrustable in it… That class started my passion for local food, and after college I worked or a co-op in St. Paul, joined the Conservation Corps, and eventually ended up in Kalamazoo working my dream job here at the markets. When not at the market, you’ll find me cooking up something seasonal in my kitchen. When I’m feeling broke I’ll aim for more of a cheaper vegetarian diet, but for the most part I’m just your basic omnivore aiming for a local meal, no clementines in site. Cost: $300/month for two people. I’m quite awful at keeping track of a weekly budget, and instead aim for a months total that I take out in cash on the 1st. Sometimes we run out early and have a left-overs week, and other times (okay most of the summer…) we go over as I stock our freezer up for the winter months. It evens out after the year though! A few things that help me out- I do get some discounts or occasional free items from vendors, and working at the co-op we receive a store discount of 20%, as well as some free items that have expired. I include this as a cheat above, thinking about diverted food waste. During the summer we tend to eat a lot of simple and quick stove top meals as it doesn’t heat up the apartment as much. We’ve been trying to eat only when we’re hungry too, which means we probably only have two meals a day and some snacks in between. 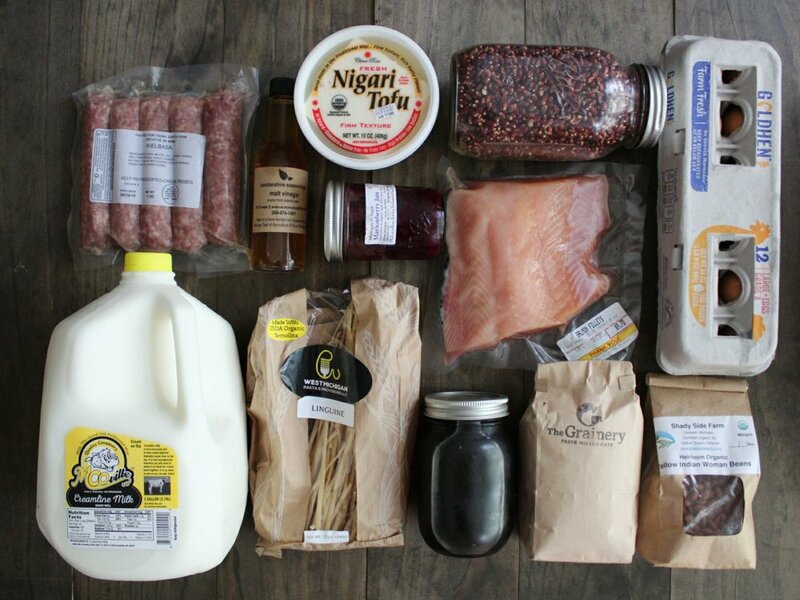 I’ve been eating a mostly local diet for a few years now, especially since I became involved with the markets. I’ve found it to be a relatively easy transition (lots of learning on the way…), but recognize that I also truly enjoy cooking and doing most everything from scratch. That’s my hobby, but it is something that all do not enjoy or have the time to do. That said, there are quite a lot of simple switches that everyone can incorporate into their life. A super easy switch to make in most every instance. Michigan grows many different varieties of beans, but chickpeas are not one of them… Try black bean or white bean dips instead. Popcorn is my all time favorite salty snack. You can find kernels in bulk, and it’s easy to cook up on the stove and flavor. My usual toppings include butter, honey, nutritional yeast, or crushed up kale chips. It’s delicious, I swear. I always here people grumble about how a carton of local eggs usually costs $4, but when you divide that out it’s only $.33 a egg! You can easily get breakfast for under a dollar with a few eggs and sautéed vegetables or a fruit. Making overnight oats is also super simple and cheap, and you can top them with jam or fruit. Use it in your coffee, in your stir fries, and in your baked goods. More expensive of course, but you’ll find you start using less which is ultimately a good thing. Living your values is tough, but voting with your dollars and shopping locally is worth it. It may mean sacrificing some of your favorites (cheese-its, Ben and Jerries, Jacks Pizza…) on the regular, but you end up simplifying your diet by not eating as much processed foods which is definitely great for you personal health. In the end, “Eat food. Not too much. Mostly plants” - Michael Pollen. Crackers, Bread, Kale Chips, Tortillas, Granola, Granola Bars, Energy Bites, Baked Goods, Quiche, Ketchup and Mustard, Sunflower Oil, Cheese Cake, Lavender Syrup, Kombucha, Juice, Popcorn, Sauerkrauts, Jams, Coffee, Spices, Cheese, and More!